Mini charms are bundles of 42 – 2 1/2″ x 2 1/2″ squares from a Moda collection. They are a great pre-cut to use for smaller projects such as pouches, bags / totes and mini’s. Recently, I received a pack of the new Little Miss Sunshine collection from Lellaboutiqe and decided to make a non traditional coloured festive mini quilt. This mini is a bakers delight using one mini charm pack, 2 charm squares, 2 layer cake squares for the trees and presents. Why stop at one block? Dive into your stash and make multiple 20″ blocks with or without sashing. The pattern for the block/ mini quilt is available on Craftsy and here. 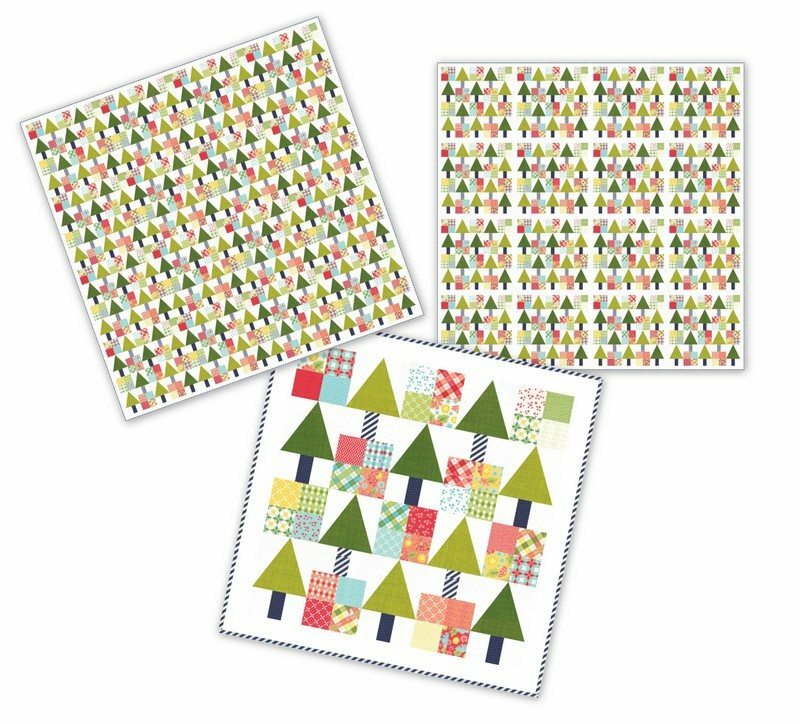 P.S There is a template included in the pattern for the Christmas trees but if you are writing your quilty Santa list, add the Tri-Rec Acrylic Tool from EZ Quilting. 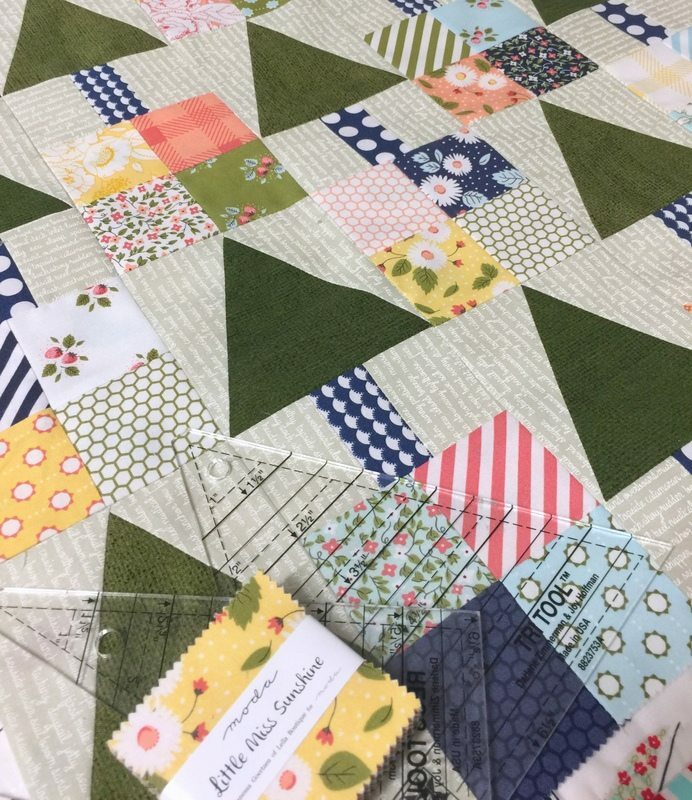 I love the triangle in a square block and have used it in many patterns. Makes cutting and piecing triangles in a square a breeze. Quilted and pieced with Aurifil 5021 50wt cotton thread. This is an adorable pattern. I will have to check that out. Hope you had a wonderful Thanksgiving. Thanks for sharing! This little quilt made me smile! Love it!! 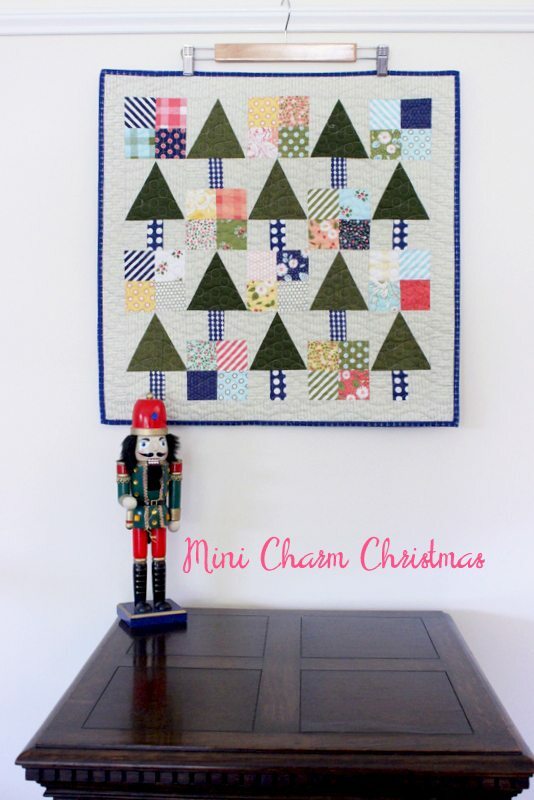 I will have to go through my collection of mini charms and make this cute quilt. Please show me a photo if you make a mini. I would love to see what mini charms you selected. now i want to make trees! Pat, I think you should.Very quick and easy.